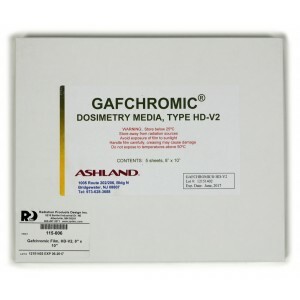 Gafchromic Film, HD-V2, 8 x 10 Inch - Radiation Products Design, Inc.
Gafchromic® Film, HD-V2, 8" x 10". 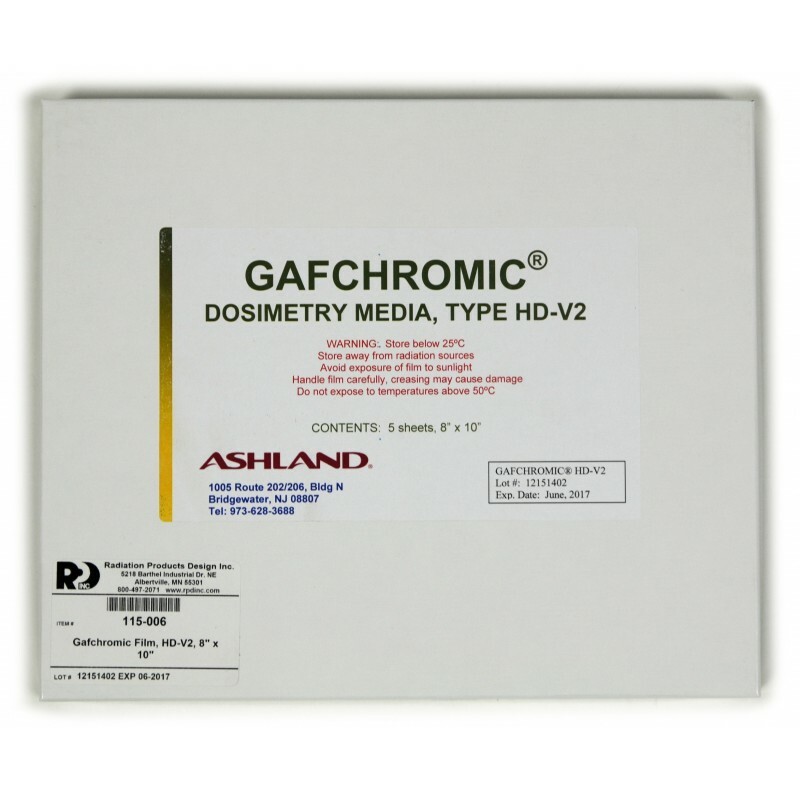 GAFCHROMIC® HD-V2 is a radiochromic dosimetry film designed for the quantitative measurement of absorbed dose of high-energy photons. As a self-developing film, HD-V2 is a perfect fit for the processor less environment. Since radiochromic film requires no post-exposure processing, there are no chemicals to dispose of and the film can be handled and used without need of a darkroom. The most exciting new feature of GAFCHROMIC® HD-V2 over the previous generation of GAFCHROMIC® HD810 dosimetry film is the incorporation of a yellow marker dye. Used in conjunction with an RGB film scanner and FilmQAPro™ software, the marker dye in HD-V2 film enables all the benefits of multi-channel dosimetry. Using the marker dye feature is not mandatory. You can continue to perform dosimetry using only the red color channel, but you give up all the advantages of the multi-channel method that will make your film dosimetry better. The structure of GAFCHROMIC® HD-V2 film is comprised of an active layer, nominally 8μm thick, containing the active component, marker dye, stabilizers and other components giving the film its energy-independent response. The thickness of the active layer may vary slightly from batch-to-batch. The active layer is coated on a clear, 97 μm polyester substrate. GAFCHROMIC® HD-V2 film has an asymmetrical cross section. Measurements indicate that the response of scanner or densitometer may be dependent on which side of the film is facing the light source. It is advised that HD-V2 film be consistently measured with the same side of the film facing the light source regardless of whether landscape or portrait orientation is used. To help in distinguishing between the sides, sheets of GAFCHROMIC® HD-V2 film are marked with a small slit near one corner. When film is viewed in a landscape orientation with the slit in the top right corner, the unlaminated active layer is on the side facing the viewer. Dose rate response: <5% difference in net density2 for 10 Gy exposures at rates of 3.4 Gy/min. and 0.034 Gy/min. When the active component in GAFCHROMIC® HD-V2 film is exposed to radiation, it reacts to form a blue colored polymer with absorption maxima at approximately 670 nm as shown in the Spectra of Gafchromic HD-V2 picture above. GAFCHROMIC® HD-V2 radiochromic dosimetry film may be measured with transmission densitometers, film scanners or spectrophotometers. As one can infer from the figure above, the response of the dosimetry film media is enhanced by measurement with red light. In using a spectrophotometer the greatest response is obtained by scanning the film and using the peak absorbances. Most densitometers measure over a band of wavelengths and transmission densitometers for measuring colored films measure over various narrow color bands within the visible spectrum, e.g. visual, red, green and blue. Such densitometers are commonly and widely employed in the photographic industry. To obtain two-dimensional information in speedy fashion, flatbed color scanners are shown to work well with all GAFCHROMIC® films including HD-V2 films. The commonly available professional photo scanners such as EPSON Expression 10000XL and 1680 flatbed color scanners can be used. These scanners are color scanners and measure the red, green and blue color components of the film in a color depth of 16 bit per channel. -To cover a dose range of 0 – 1000 Gy requires 6-8 dose points, for example, 0, 25, 50, 100, 200, 400, 800 and 1200 Gy.